There’s something so incredibly alluring about a blank canvas. It’s a common metaphor for a lot of things in life, including life itself, and for good reason. The possibilities are endless. My love for art and painting dates back to childhood when my mom (AKA Singaporean Martha) encouraged us to draw, paint, color, sew….pretty much engage in any creative activity after school. And I love her for it. I think Kurt Vonnegut shared the same spirit as mom. The thing is, anyone can be creative. People exhibit prohibitive behavior the most on themselves (me included) and this is definitely true when it comes to the creative process. I used to think, “I’m not artistic or creative.” Well, you get to a point in your life when you just don’t care anymore. 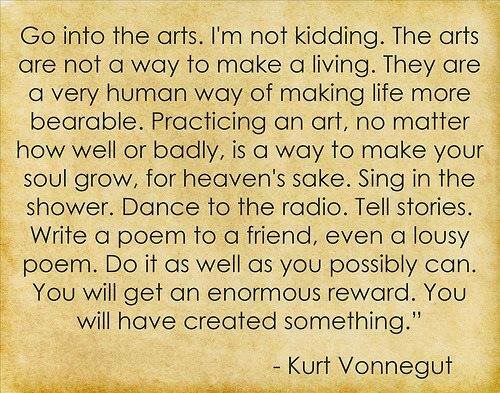 As Kurt said, no matter how badly, you will have created something. You will make your soul grow. So let’s grow our souls and shrink our wall spaces, shall we? 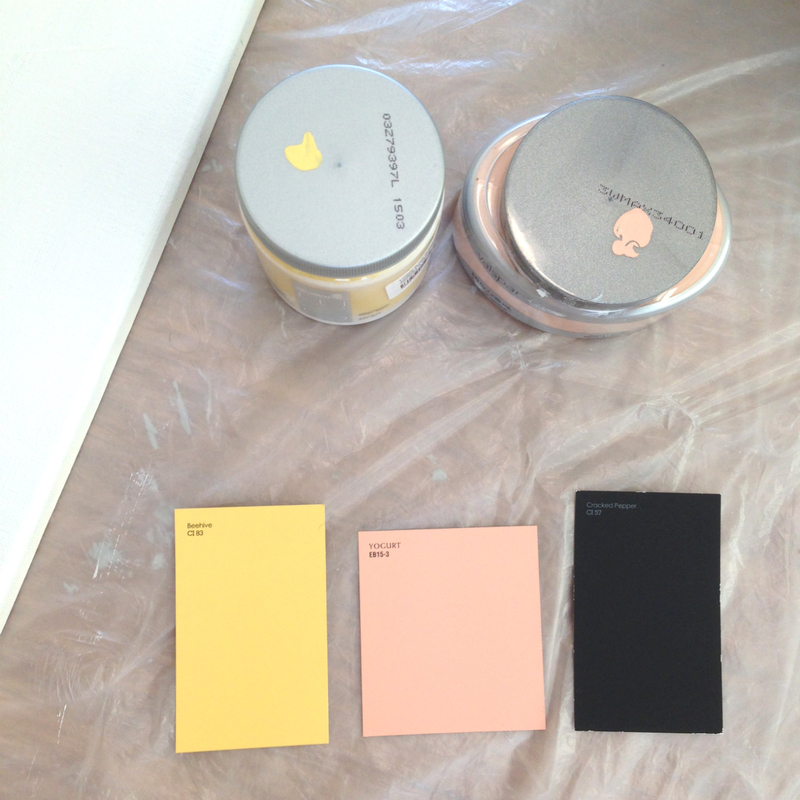 Picking out my paint color was easy. 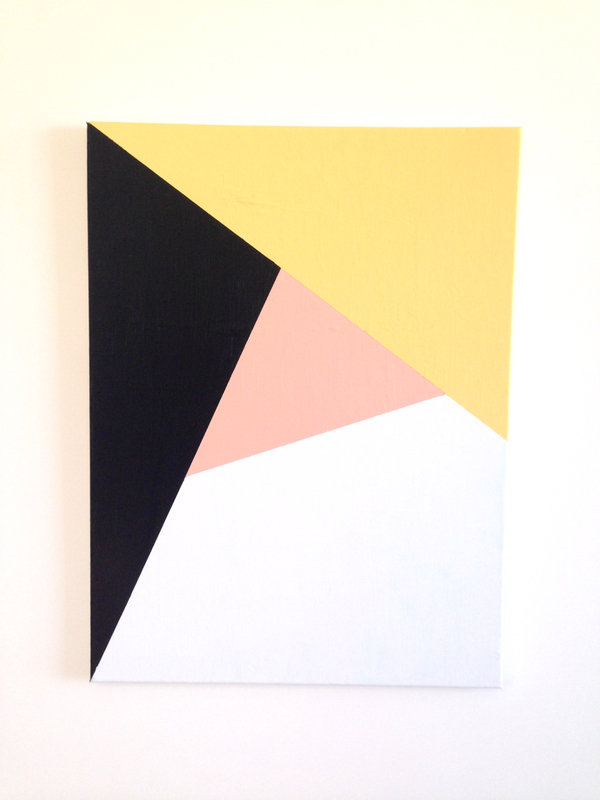 I’m currently crushing on the hot combo of pale peachy pink, black, and pale yellow. It must be my love for the 80’s. I used acrylic paint for this project. Oil will work as well, if you’re so bold. It just takes longer to dry. I LOVE painting with oil because it goes on much more smoothly than acrylic. But for a quickie project, acrylic works best. 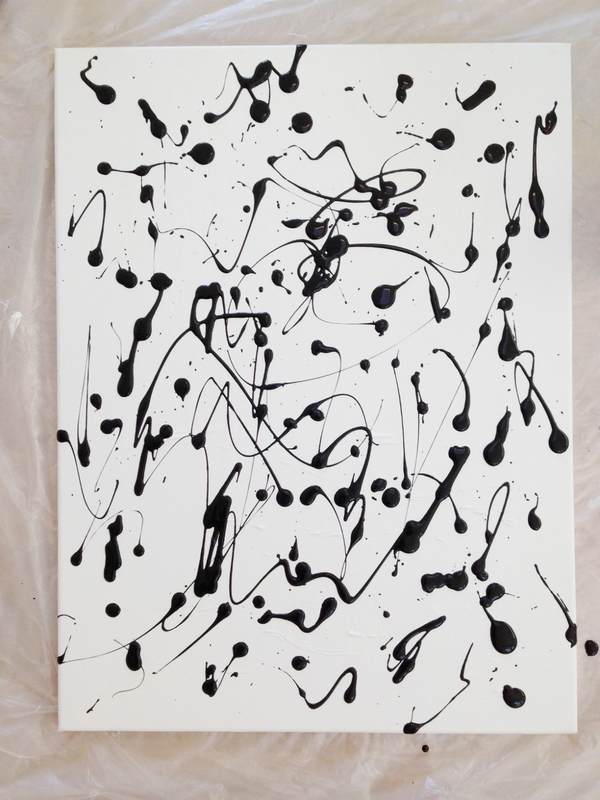 I picked up a little bottle of Craft Smart black acrylic paint at Michaels for $1.29. I purchased the yellow and pink paint at Lowe’s because I didn’t want to deal with mixing, and wall paint works fine as long as it’s acrylic. Lowe’s will mix your desired color for you and you can purchase sample size quantities for $3 each. Score. This section is dedicated to my FAB high school humanities and English teacher, a woman who continues to be an influential and inspiring figure in my life. 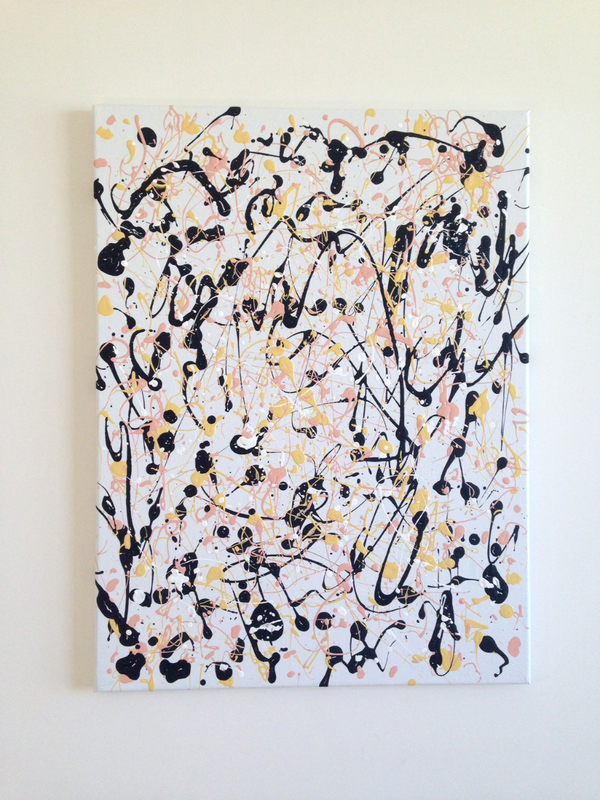 She convinced us that Pollock’s paint splatter and drip masterpieces required enormous talent and artistry. Some of us didn’t buy into it. One of my former classmates even created his own version by scribbling on a piece of paper with crayons. He framed it, titled it “Butterflies in the Wind,” and presented it to our teacher, who was tickled pink. 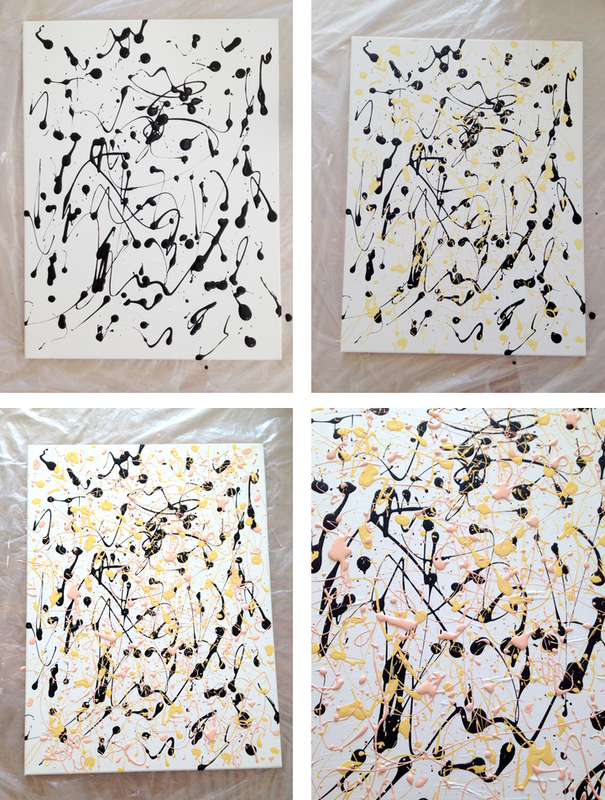 So here’s to the inimitable Mrs. J.
I’m a huge Pollock fan and to this day, marvel at his pieces (pre AND post splatter). My favorite of his is The Deep, a stunning example of his drip work. Grab your paint and let the splattering begin. I used a mid-sized brush, dipped it with lots of paint, and drizzled it across the canvas. 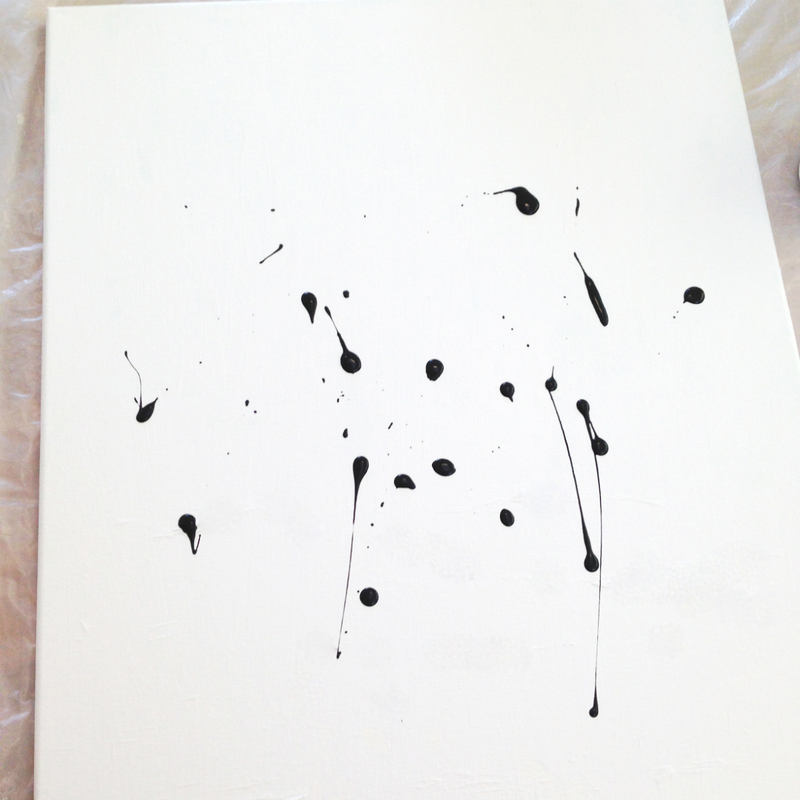 Next, I splattered the paint with quick, swift back and forth movements of my hand that carried the brush. I know what you’re thinking. 5th grade “coming of age” health class. Uh huh. I waited for each color to dry before applying a new color. This prevents the paint from mixing. Use different size brushes or ways of splattering to mix up the shapes. Think Rorschach inkblots. This one’s called “Lin’s Mind” because it represents the chaotic thoughts going through my head most of the time. I started with a VERY crude concept for this piece. 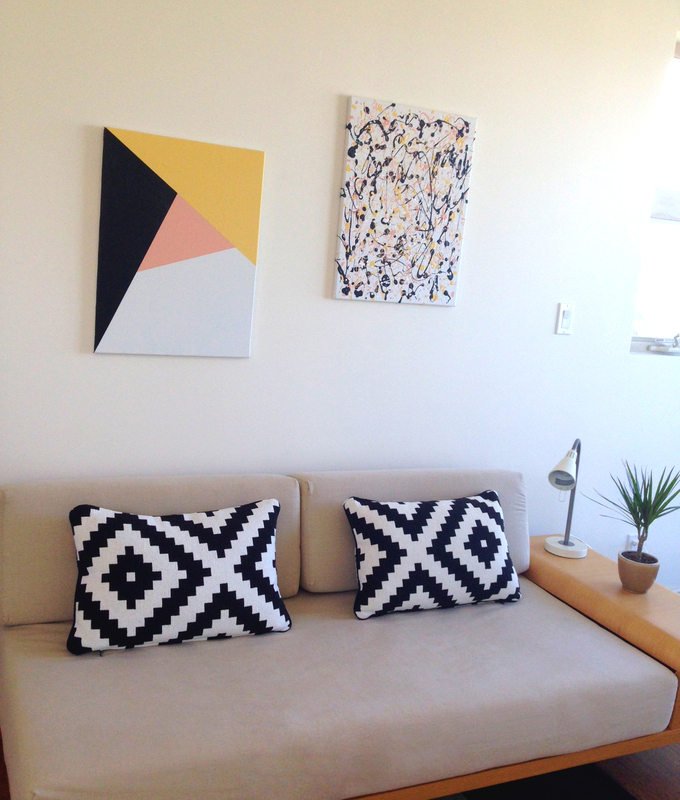 I have a thing for geometric shapes, so I laid out some triangles and played around with the color placement. Here’s where painter’s tape comes in handy. 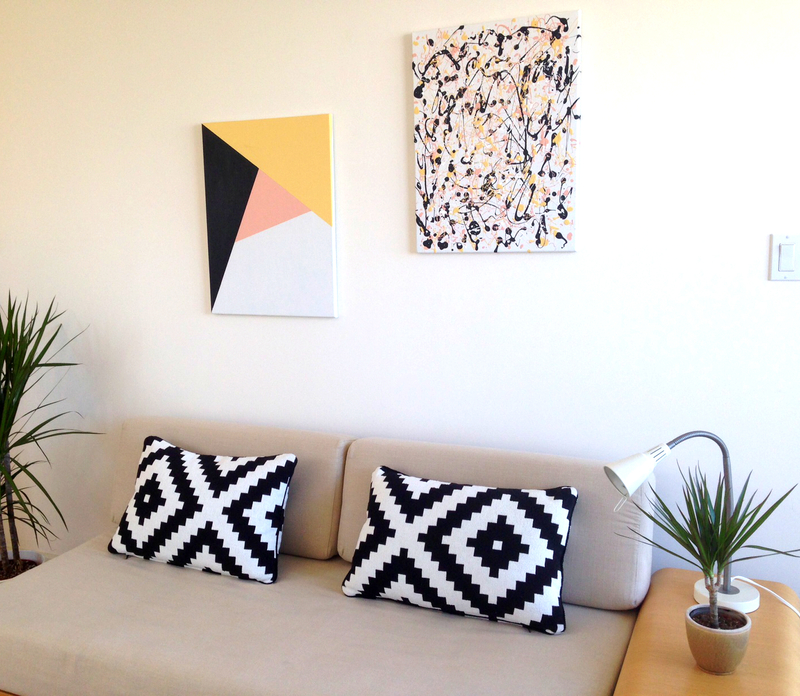 Grab your canvas and paint a layer of white paint. 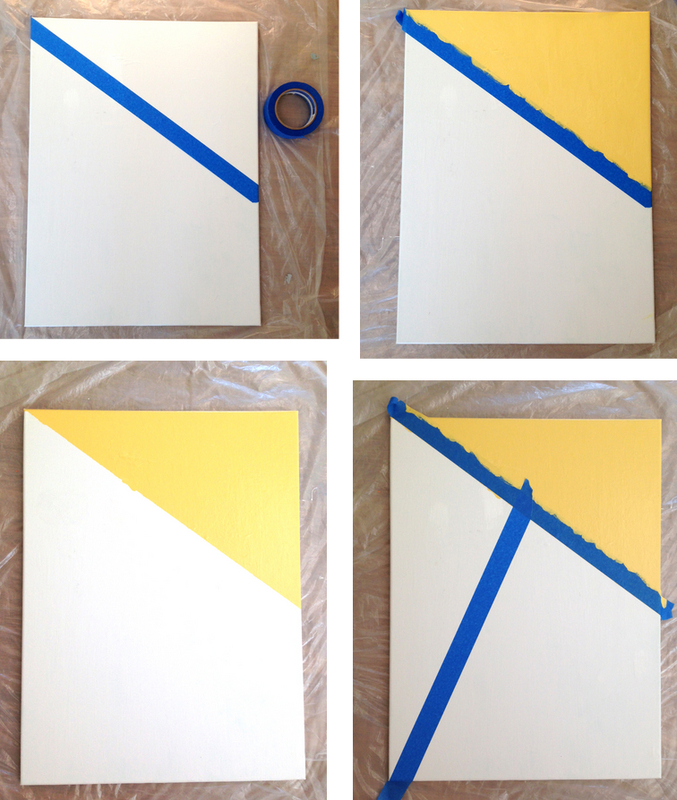 Once the paint dries, take a strip of tape and lay it across the painting to create the yellow portion. Start painting! After you complete each section, pull off the tape and run it (or a new strip of tape) across the section where you just painted (in my case, the yellow section). 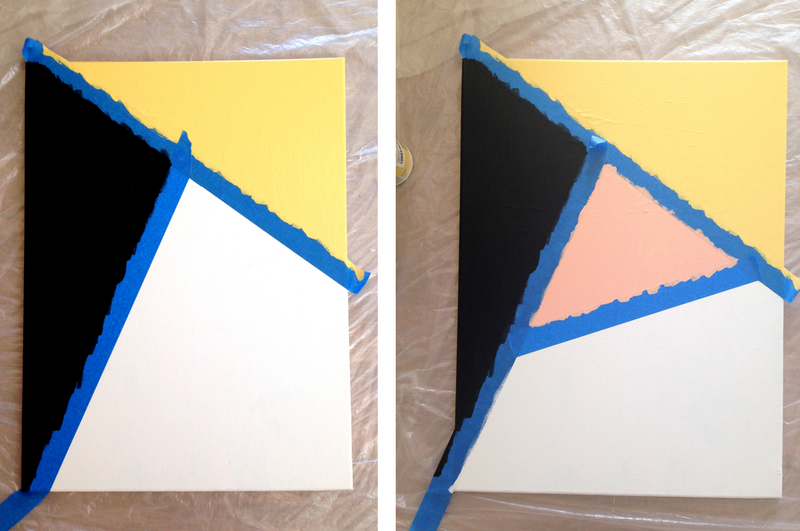 Place another strip to create the black section of the painting. Note: paint dry time is typically 1 hour. I waited about 2 hours or more to be on the cautious side and to avoid any “oh sh*t” moments. You can paint as many coats as you’d like for each section. Because my mantra is “it doesn’t have to be perfect,” I went with only 2 coats. 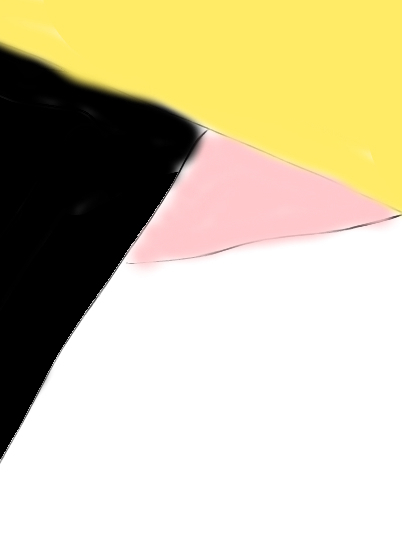 Unlike a lot of people, I actually like seeing paint brush strokes. I used to subscribe to the “smooth as a baby’s bottom” school of thought and even sandpapered my paintings between coats to create as smooth of a surface as possible. Who has time for that? Brush strokes give texture and make a painting interesting, as if you can follow the artist’s process and flow. Slowly remove the blue tape. Some of the paint might come off with the tape. You can easily touch up oopsies using a small brush. ….we now have a little pink feminine power in our rec room. Do it!!!!! Super easy, fast, and affordable! Love your post, Lin! It brought back memories! My hubby and I once did our own painting, too, by splattering the paint onto a blank canvas and then painting our hand prints on there, as well. I should post it, too! 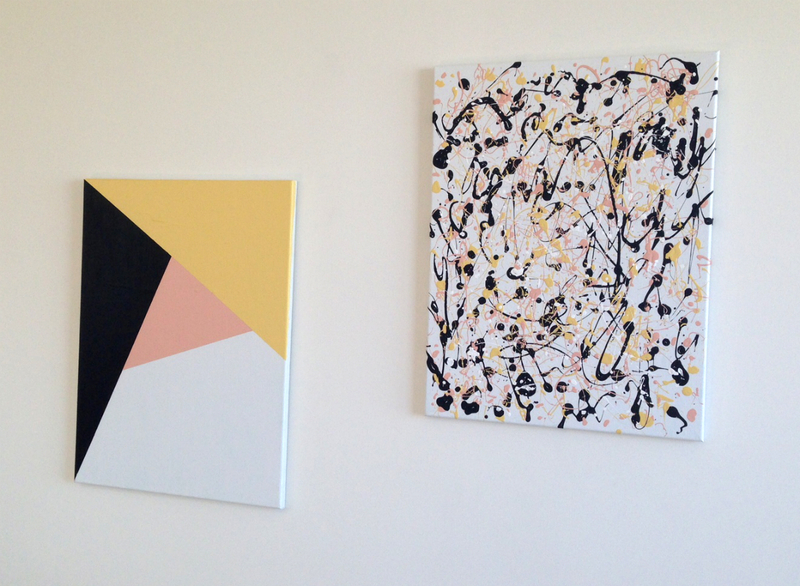 Making art yourself for your home is priceless and will always warm the heart and soul when looking at it. Thanks for the great post!! Come visit me, again, whenever you can! Happy painting! Thanks for your sweet comments! I’d love to see your piece that you did. Consider that a blog post request 🙂 I love your Thomasville piece. Lovely! Aww thank you, thank you!! Ya, I kind of want to keep that Thomasville piece lol. . . but I would like for someone else to enjoy it! I have it up for sale if you or anyone you know is interested. Thanks for commenting back! If you have any tips for me, since I’m a newbie to the blog world, you can email me:-) Happy Friday and Happy Blogging! Music to my ears Rebecca! Have fun and let me know how it turns out!